Mercedes Benz G Wagon G63 AMG LHD 4 wheel drive – 2017, 33,506 miles. Obsidian black metallic with Designo black leather and Black Piano lacquer hardwood, Fully equipped according to std spec on the G63 AMG version, Other extra equipment; AMG Red Brake Caliper, Blind Spot Assist, Mercedes Emergency Call System, Hermes Communication Module with Live Traffic Info, Rear Seat Entertainment with dual monitor rear, Tv Tuner, MB Comand On-line, Harman Kardon Logic 7 Surround Premium Sound Pack, Smartphone Integrated Car play, Park Assist pack Parktronic, Active Distance Assist Distronic, Electric Roof Rack, Tilt Function, Heated Windshield Wipers, Rear-luggage compartment, Designo interior Dinamica Black, Interior mood light pack, Parking camera rear, AMG Speed ​​Shift Plus 7G-Tronic, Heating in the front and rear seats, Seat Comfort Pack, Enclosures in stainless exterior pack, Designo Exclusive Pack. 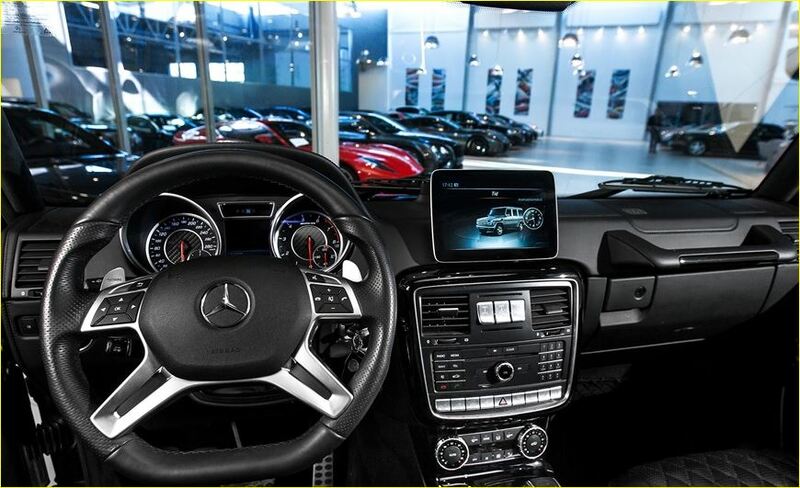 Development started in 1972, focusing on 4 wheel drive off-road abilities and maximum safety and comfort; with a cooperative agreement between Daimler Benz and Steyr Puch in Graz, Austria. Mercedes-Benz engineers in Stuttgart were in charge of design and testing, while the team in Graz developed the production plans. The first wooden model was presented to Daimler-Benz management in 1973, with the first drivable prototype beginning various testing including German coalfields, the Sahara Desert, and the Arctic Circle in 1974. Construction commenced on a new production facility in Graz, where the new cross-country vehicle would be assembled nearly entirely by hand in 1975, with production of the “G Model” beginning in Graz in 1979. In 1980, the Vatican took delivery of a specially made G-Wagen outfitted with a clear thermoplastic top which served as the Pope mobile. The “Papa G” later took up permanent residence at the MB museum in Stuttgart, Germany. The first major refinements were introduced in 1981, including an automatic transmission, air conditioning, an auxiliary fuel tank, protective headlamp grilles and a cable winch. Fuel injection became available in 1982, when the 230 GE was introduced in Turin, along with more comfortable and supportive front seats, auxiliary heating, wider tires and fender flares. For 1985, differential locks, central door locking and a tachometer became standard and by 1986 over 50,000 G Models had been produced. The G-Wagen was facelifted in 1990. In 1989, for the 10th anniversary of the G Model, a new model variant with permanent 4-wheel drive, a wood-trimmed interior and optional Anti-lock Braking System (ABS) debuted at the Frankfurt International Motor Show. Production began the following April. For 1992, a new sub-series for professional users began production. The civilian model began to offer cruise control, a stainless-steel spare-tire cover, running boards and Burl Walnut wood interior trim. The same year, the 100,000th G Model was built in Graz. In 1994, the model line was officially renamed the G-Class. Ventilated front disc brakes and a driver’s air bag became standard. In 1996 the automatic transmission became an electronically controlled 5-speed unit. Headlamp washers, cruise control and a front passenger’s air bag were added. In 1998, the range-topping G 500 with a 296 hp V 8 was introduced for series production. For 1999 a limited run of V 8 powered “G 500 Classic” special editions marked the model’s 20th anniversary. A multifunction steering wheel was added to all models. Later in the year, the new G 55 AMG debuts as the most powerful G-Class yet, with 354 hp. The U.S. market launch of the G-Class took place in 2001. New alloy wheels, a chrome grille and body-color bumpers plus a more luxurious cabin were introduced. New dynamic control systems included the Electronic Stability Program (ESP), Brake Assist and the 4 wheel Electronic Traction System (4 ETS). The G 55 AMG was upgraded in 2004 with a supercharged V 8 engine developing 476 hp. In Siberia in 2006, a documentary filmmaker was the first foreigner to reach the world’s coldest region with a passenger vehicle in winter, driving a stock G 500 nearly 19,000 km without a single breakdown, in temperatures as frigid as −63˚F/-53 °C. A new version was expected for 2007, but the new GL-Class did not replace the G-Wagen, and it will continue to be hand-built in Graz, Austria at an annual production of 4,000 to 6,000 units. 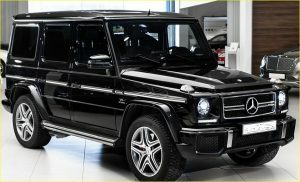 In February 2009, Magna Steyr, an operating unit of Magna International , announced that it signed an agreement with Daimler AG to extend the production of the Mercedes-Benz G-Class at Magna Steyr in Graz, Austria until 2015. 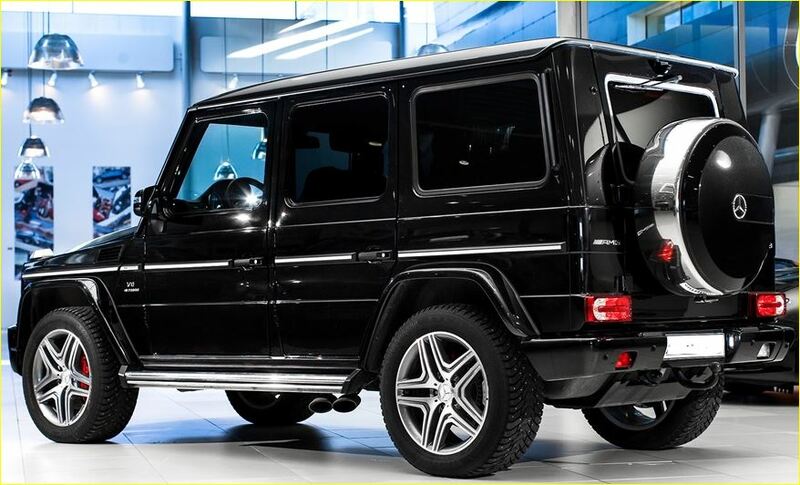 Besides the production, the further development of the G-Class by Daimler’s subsidiary MB Graz since 1992. For 2007 the output of the G 55 AMG was raised to an even 500 hp. Bi Xenon headlamps, corner-illuminating front foglamps and new scratch-resistant nano-particle paint finishes were offered for the first time. 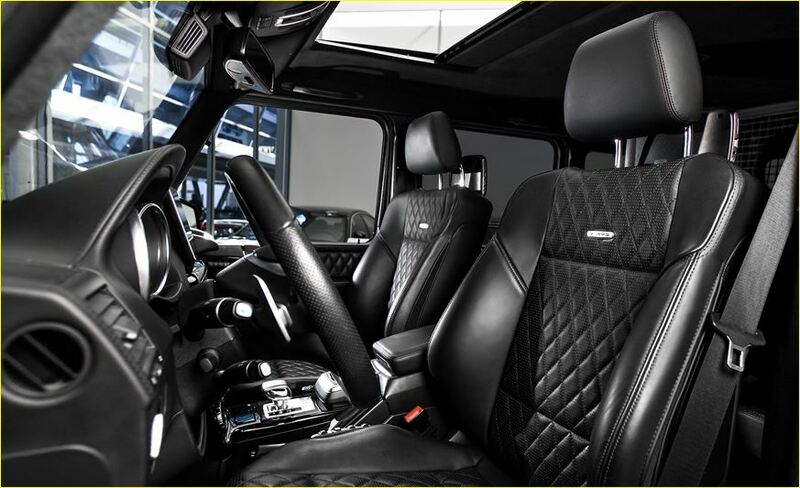 In 2008 more-refined instrumentation and controls were included in the G-Class cabin, along with the COMMAND system with hard-drive-based navigation, a rear view camera, voice control, Bluetooth and a Tire Pressure Monitoring System. The Vatican receives a new white “Popemobile” based on a G 500. 2009 marked the 30th anniversary of the vehicle, with over 200,000 units having been manufactured in Graz since 1979. For further information on this car, please call 07785 355 378 or from overseas +44 7785 355 378.